While we have been able to almost rid the planet of some diseases, like smallpox, other health problems seem here to stay and sciatica is in that group. The ancient Greeks coined the term to describe pain experienced in the hip or thigh. Modern sufferers would generally complain about the same kinds of severe pain, but today our lifestyles and careers can often share some of the blame for the onset of symptoms. While sciatica has been a major problem for centuries, I don’t think the Greeks were sitting at their desks in front of a computer screen all day long like so many of us do here in Santa Monica and the surrounding areas. But before we get into more specifics about sciatica, let me briefly describe its cause and a range of symptoms. The sciatic nerve is the single biggest nerve in our bodies. It’s formed by nerve branches that go out from between the bones in our lower backs. When pressure is put on these nerves it can cause shooting pain down one or both legs, as well as numbness, tingling and even weakness. You may have noticed that the label “sciatica” is getting tossed around a lot today. 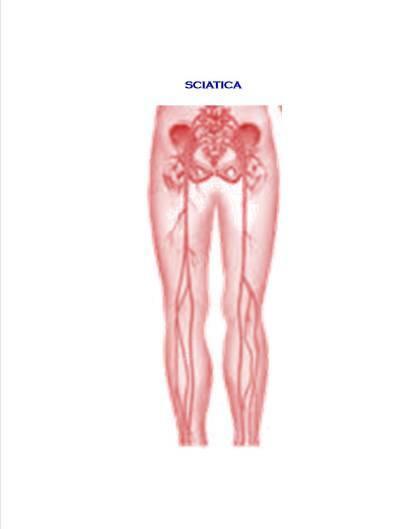 However, it’s important to point out that not every pain that radiates down the leg is sciatica. Other conditions can present themselves in this way, including local distress, or isolated nerve or muscle dysfunctions. Piriformis syndrome – known to mimic sciatica – could also be the culprit. It is essential that a professional diagnosis be made to distinguish the two so you can get the relevant care and treatment. With sciatica, the problem starts in our lower back, generally with a herniated or bulging disc. The nerve roots become irritated and the pain kicks in. These kinds of disc conditions can be caused by an accident, but today they are often caused by lifestyle habits. Generally speaking, anything that leads to “bad back health” can lead to sciatica. If you spend too much time sitting down, have poor posture, battle with non-ergonomic working conditions, have bad sleeping habits or are under a lot of stress, you may find yourself suffering from the terrible pain of sciatica. In addition to the pain and emotional distress experienced by the sciatica sufferer, the condition can put family members under pressure and strain personal relationships. It can be a terrible situation and with our aging population, we’re likely to see more people dealing with sciatica in the coming years. Dr. Ramer’s holistic approach to treatment helps her patients prevent sciatica from becoming a chronic or reoccurring condition. We noted above that a variety of conditions can cause symptoms similar to sciatica. This makes a comprehensive physical and neurological examination a critical first step on the path to relief. Without the right diagnosis, determining the proper treatment is impossible. The good news is that chiropractic care – and specifically the gentle, low force activator method of treatment – along with adopting a holistic, lifestyle-based approach, can virtually relieve the pain of sciatica and help prevent its re-occurrence. At Ramer Chiropractic we treat many patients with sciatica symptoms in the Santa Monica area and have achieved tremendous results by combining chiropractic treatment, myofascial release, cold laser therapy, exercise and yoga. I want to point out that our gentle method of adjustments do not lead to any further irritation and that it has proven to be quite helpful. Our experience is backed up by numerous scientific studies that have shown the low force activator instrument method of adjusting practiced by Dr. Ramer to be extremely effective in correcting the conditions that cause sciatica. In one of these studies, some 70 percent of the patients considered themselves better or much better after just two weeks of gentle, low force chiropractic treatment. Further, many of the patients in this study suffered from chronic lumbar disc herniation, which chiropractic treatment was able to correct. Another treatment Dr. Ramer is able to use for the benefit of her sciatica patients is myofascial release. This treatment applies gentle sustained pressure into the body’s myofascial connective tissue – the tough membranes that wrap, connect and support muscles – to correct restrictions. This helps eliminate pain and restore motion. Cold laser therapy and laser acupuncture are other options Dr. Ramer may use in the treatment of sciatica. Each patient at Ramer Chiropractic Clinic receives individualized treatment programs designed to relieve their pain and restore their health as quickly as possible. For Dr. Ramer, it’s critically important that her patients are able to maintain their good health. Customized yoga and exercise routines that patients can practice at home help them improve their health and prevent the reoccurrence of sciatica. She also has a very successful system for helping her patients establish good posture and this greatly reduces lower back pain and related issues. We hope you never suffer from sciatica. Sometimes sciatica can be so severe that it virtually disables people, causing them to miss work and be unable to function around the home. However, if you – or anyone in your family or circle of friends – may be suffering from sciatica, please call for an appointment today. The first step to restoring your health and living pain free is for Dr. Ramer to diagnose your condition and design a custom treatment program.